The Samsung Galaxy S9 is finally here, alongside Galaxy S9 +. Though there is only a little visual difference compared to it's replacing - Samsung Galaxy S8, The Samsung Galaxy S9 still looks pleasing at every glance. Undoubtedly, performance enhancements come with this iterative updates, and in addition, the camera and biometrics systems also are made drastic improvements. 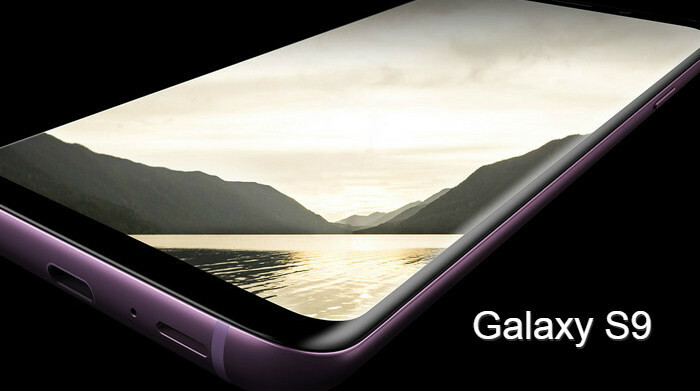 Especially it's said that Samsung Galaxy S9 is all about the camera, because this time it comes with f/1.5 and f/2.4 adjustable apertures, 2x lossless zoom, and Live Focus etc. If you start using the Samsung Galaxy S9, on which some contents like photos, contacts, music are needed to be transferred from old phones. 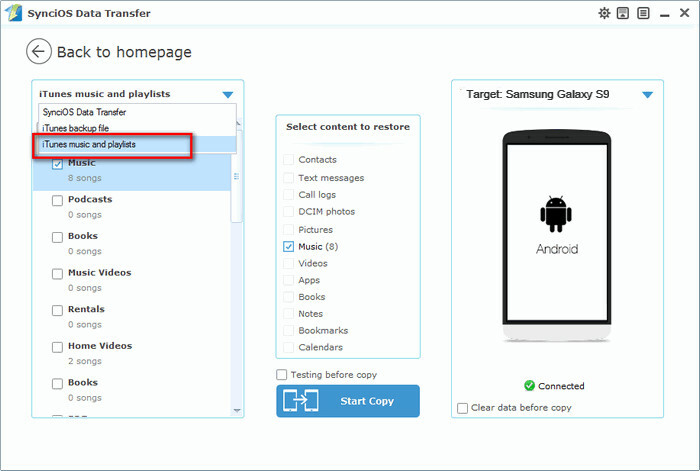 And you may take much effort to move or sync thousands of music from multiple resources including iTunes, Spotify, YouTube etc, or from other devices, so here we would like to show you the ultimate guide on how to transfer iTunes music or playlists to Samsung Galaxy S9. You can copy iTunes music from iTunes media folder (Windows 7/8/10: C:\Users\username\My Music\iTunes\) to Samsung Galaxy S9 directly, but please make sure that you have checked "Copy files to iTunes media folder when adding to library" selection to make iTunes music, playlists, and videos saved automatically to computer. 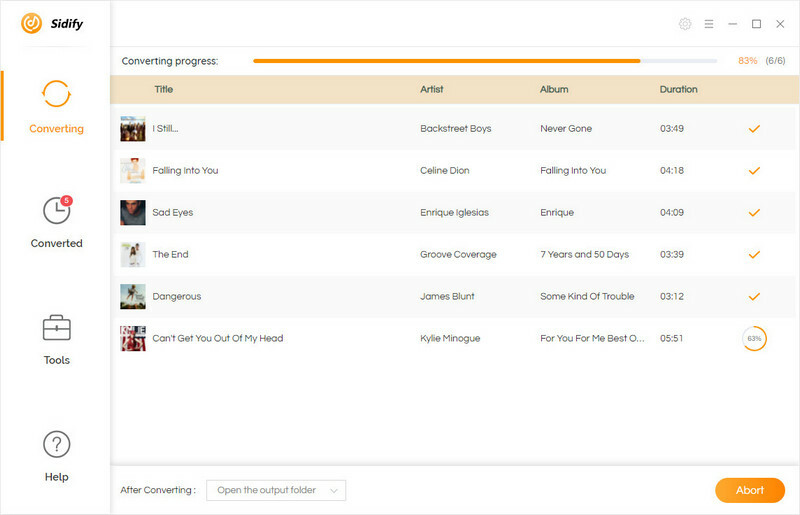 Or you can turn to the specialized tool - Syncios Data Transfer to help you transfer music or playlists from iTunes library. 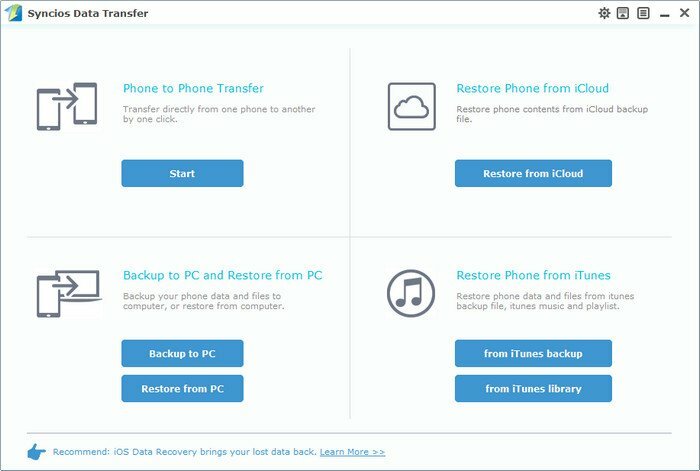 What’s more, you can transfer more contents from your old Android/iOS device to Samsung Galaxy S9, backup your phone data from PC or restore data from iCloud or iTunes. Download and install Samsung Data Transfer on PC or Mac, then launch it. Connect Samsung Galaxy S9 to computer with USB cable, and four modules will pop up after your Samsung get connected successfully. You can click "Restore Phone from iTunes Library" on the homepage, then a window will pop up and you can select iTunes music and playlists from the drop-down list from the left panel. Now you can check Music box on the panel and click "Start Copy" to transfer iTunes music or playlists to Samsung Galaxy S9. Apple Music app works slack on Android, so you can reply to another new way to sync Apple Music songs or playlists from iTunes library to Samsung Galaxy S9, rather than sync music to Samsung via Apple ID. 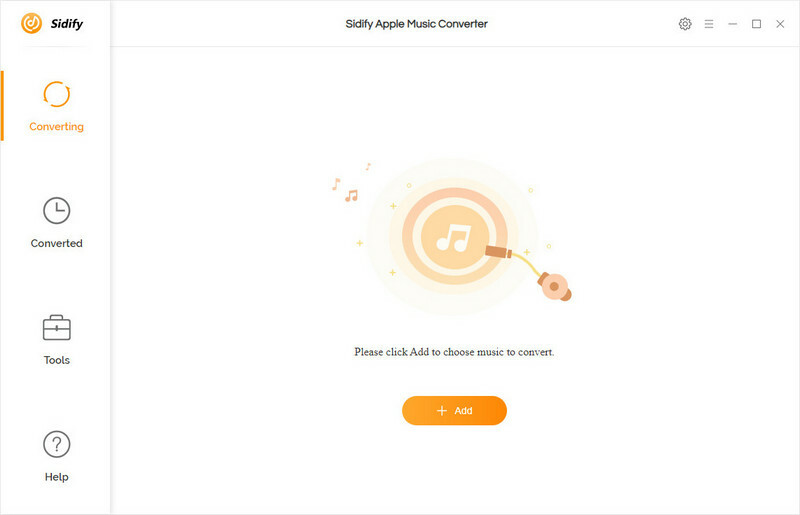 Because Apple Music songs are DRM protected and it's not possible to copy them from iTunes library to Samsung Galaxy S9 directly, you can use Sidify Apple Music converter to break down the DRM protection and convert Apple Music songs to plain MP3, AAC, WAV, or FLAC. Then you can transfer these converted Apple Music songs to Samsung Galaxy S9 without limitation. 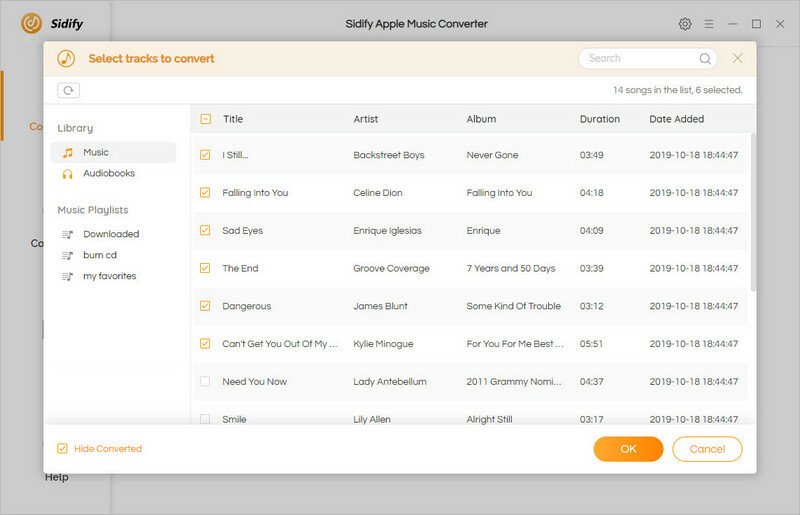 Launch Sidify Apple Music Converter on your PC or Mac after installation. You can click button to add Apple Music songs or playlists from iTunes library. Please make sure that the Apple Music songs have been already downloaded within the validity period to your iTunes library. Click OK to check the Apple Music you added. 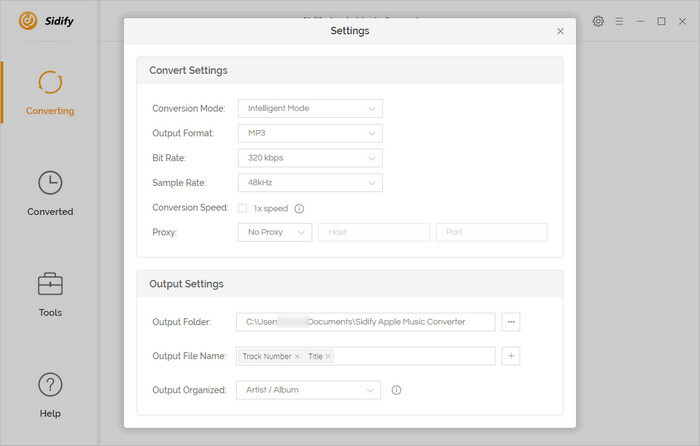 Click on icon to choose output format as MP3, AAC, WAV or FLAC and customize other basic settings like output path, conversion speed. Finally, you can click "Convert" button to start converting Apple Music songs to the audio format you chosen. After the conversion complete, you can click icon to find the converted Apple Music files. The well converted Apple Music songs are stored on local drive, so now you can transfer them to Samsung Galaxy S9 via USB cable or third party tools.